Once your children have got the cooking bug, they are likely to want to create meals entirely on their own, and this can be a nerve-wracking experience for parents! Instead of hovering and supervising every moment of their cooking, which can make them tense and destroy the mood of confidence that you’ve worked so hard to create, why not supply them with a list of healthy, no-cook dishes, and sit back in confidence that what they create will be safe, tasty and nutritious. These recipes are ideal for children aged eight and up to cook and give them plenty of scope to be creative. 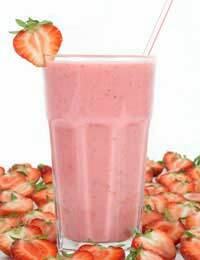 Smoothies could have been invented with child cookery in mind – their smooth velvety texture and rich taste mean that most children love them, and it’s the easiest way to get children to consume fruit, dairy products and even nutritional boosters like ground flax seed without even knowing they are doing it. Having some frozen fruit always to hand gives these smoothies a really special taste but you can make it with unfrozen fruit just as easily. Simply put all the ingredients together in a blender and mix until smooth before pouring into tall glasses. Making Viking ships is a way to get children to try new foods that might usually strike them as ‘strange’ – often, getting children to focus on creating a specific visual appearance for a new food can make them much keener to try eating the end result. Put the sardines in a bowl and let your child mash them with a fork until there are no large lumps. Mix together with the fromage frais, or soft cheese, tomato puree, and some freshly ground pepper if your child likes it and mix thoroughly. Now spread the mixture on the halved rolls, making sure that it reaches to the edges. Allow your child to arrange the radish slices around the edge of each roll, overlapping them slightly, to resemble Viking shields. While he or she is doing this, you can cut the tomatoes in half, scooping out the cores and sliding each half onto a cocktail stick which your child can push into the roll to make a sail. If your child does not like tomatoes, substitute a cheese slice as a sail, piercing the top and bottom with the cocktail stick. If possible, serve on blue plates to resemble the sea! This pudding is a lot of fun and can be made by the youngest child. It also has a number of substitutions depending on what you have in your cupboards. Strictly speaking it’s not no-cook as it requires the use of a microwave, but only for a few seconds. Put the tortilla on a paper towel on a plate and microwave on high for ten seconds. Then allow your child to spread it with peanut butter and one of the other toppings to their taste before putting the peeled banana on one edge of the tortilla, folding over the ends and rolling it up before pouring a little maple syrup or honey on the parcel in an attractive pattern and sprinkling with chopped nuts.